Short programs are not only a great way to spend your break from university, but also gain an overseas experience without disrupting your course structure. Depending on the kind of program, you can get credit toward your degree by participating in a short program. Costs will vary from program to program. If you are getting credit towards your studies, you are eligible to receive a mobility grant from La Trobe Abroad. Please see the Grants, scholarships and costs section for further information regarding funding available for short programs. Please note, the grant policy states that students will only receive one form of funding: mobility grants or Australian Government grants. Check out the IRU Scholars in Asia information on the website. PG Research Students: Please add to your Overseas Short Program (OSP) Application a one page statement explaining how the overseas program will impact your research, and list any other funding you are receiving. A letter of support from your Supervisor must also be included and they should sign your OSP form as well. Finally, some form of evidence from the Graduate Research School (GRS) must be received by La Trobe Abroad indicating you have completed their travel process. Applications will be assessed on a case-by-case basis for $500 mobility grants and will depend on available funding. Please ensure your screen zoom is adjusted to view all seven columns. If not, please use the scroll bar at the bottom of this section's table to view hidden columns. Domestic students participating in an Approved Third Party Provider Internship are eligible to apply for the limited $1000 Student Mobility Assistance Scholarship (SMAS) [Word 98 KB]. Applications are assessed on a rolling basis and must demonstrate experiencing financial disadvantage. Students who qualify as financially disadvantaged and are not receiving the above SMAS may also be eligible for the ASSC College Employment Grant. Visit the website for more info. Guide for seeking credit for an overseas internships [DOC 32KB]. - Sates: January - February. - No Indonesian Language skills required. - Academic credit available, subject to University approval. - $3,000 New Colombo Plan Mobility Grants available subject to eligibility. - Application and administrative fees apply. OSP Application Form due 6-8 weeks before program start date. See more information on the ACICIS website. $3,000 New Colombo Plan Mobility Grants available subject to eligibility. See website for more information on fees and scholarships. Intern in New York City, USA - $1000 Scholarships available! Internships, year-round in various disciplines University-wide 120 days before the internship starts Limited Website for details. Ranges A$3,400-9,000 depending on destination. Typically does not include flights, visa fees, daily meals and transport. due 6-8 weeks before program start date. 15 September 2017 Limited; special scholarships may be available. See website (doesn't include visa fee) - total approximately A$10 000. More information about the cost below. accepted on a rolling basis, due date approximately 4 months prior to start date. Open $6,835 USD. Not including airfare, personal expenses. ISA - Dublin, Ireland Internships - 6 weeks or Custom Dates University-wide OSP Application Form due 6-8 weeks before program start date. Applications accepted on a rolling basis, due date approximately 4 months prior to start date Open $5,900 USD. Not including airfare, personal expenses. ISA - Santiago, Chile Internships - 6 Weeks or Custom Dates University-wide OSP Application Form due 6-8 weeks before program start date. Applications accepted on a rolling basis, due date approximately 4 months prior to start date. Open $5,770 USD. ISA - China, New Zealand, South Korea, Spain Internships - 6 Weeks or Custom Dates University-wide OSP Application Form due 6-8 weeks before program start date. Applications accepted on a rolling basis, due date approximately 4 months prior to start date. Open $5,500 - $6,500 USD. Not including airfare, personal expenses. Projects Abroad, Ghana Flexible start dates and duration Law students, internship with Ghana Legal Aid Board or Projects Abroad Human Rights Office in Cape Town. Case work under supervision of locally admitted attorneys. Projects Abroad-Mongolia, Samoa Flexible start dates and duration Journalism and media students, journalism internship with a newspaper, magazine, TV or radio station. Developing stories, reporting on events and creation of a portfolio. Projects Abroad-Peru Flexible start dates and duration Environmental science students (environmental management/science and ecology, wildlife and conservation biology, zoology), internship at Taricaya Ecological Reserve. Rainforest conservation, wildlife research, biodiversity studies and animal rehabilitation and release. Projects Abroad-Cambodia Flexible start dates and duration Finance, business, economics, accounting and marketing students, internship with the Khemara Organisation. Assist small-scale entrepreneurs in creating and developing businesses in Cambodia. Projects Abroad-Sri Lanka Flexible start dates and duration Finance, business, economics, accounting, human resources and marketing students, internships in a variety of different areas of business available in Colombo, main focus on marketing, public relations, human resources, accountancy and finance. You can find more information on the AIC website. Please note: you need to arrive by the AIC start date to attend Orientation. If you don't arrive on time, you will receive a shorter independent Orientation tour. Join us for an information session via webinar to hear about program details and placement opportunities. Find out more about this unparalleled professional, academic, cultural, and personal experience. Macintosh®-based attendees: Mac OS® X 10.5 or newer. All La Trobe University participants may apply for a A$500 mobility grant, which will be transferred to the student' nominated bank account upon submission of completed Overseas Short Program form, Travel Form, Insurance and Pre-Departure Module Postcard (see above) and close to the AIC payment deadline. A non-refundable deposit of A$500 will be required to AIC shortly after the application closing date as per the AIC website. Full program payment is due by early December 2015. Payments are to be made directly to AIC. Academic Credit Option: Students may now pay for and register for an optional Drexel University course to run concurrently to the internship on Cross Cultural Communication. This option may assist students getting credit approval for the internship because the course will add an academic element. The cost for the additional course is $500AUD on top of the above pricing. Please note, some out-of-pocket expenses may be incurred by students, including government fees, food, health care, public transportation, etc. More details are available on the Global Experiences Washington DC website. What goes into Global Experiences programs? Below you will see an estimate of what the program tuition includes and what it goes toward. Global Experiences is committed to the most affordable programming while still ensuring the best possible experience for our participants. Internship placement, pre-departure staff, career development, visa assistance - providing personalised and high quality programs means having committed staff spending hours of one-on-one time with our participants. Housing - we often negotiate contracts with housing 18 months in advance and make deposits for our students to secure we get the best location and quality housing available. Location staff, program orientation costs and social activities - we have permanently based staff in every location and will send more staff to any location for larger groups to make sure our participants have plenty of support. Management and organisational costs - management, marketing, rent, university program development and campus visits, technology, professional services, travel and program development and other costs. A non-refundable deposit of USD$1000 is required before the application closing date. Full program payment is due in December. TBC-information sessions about the Internship Programs in Washington DC. These are winter and summer short programs held at a La Trobe University exchange partner university. Students are required to make an application directly to La Trobe Abroad, who will nominate you to the University. To participate on these programs students require a minimum weighted average of 65%. An academic transcript is to be submitted with the short program application. La Trobe Colleges and Schools facilitate a number of short term programs and study tours each year. These programs are led by a La Trobe academic or arranged by the College in coordination with an affiliated international institution. As these may change each year please contact your College or/and school office for more information. Short term study programs coordinated through approved third-party providers. La Trobe University has developed strong relationships with AIM Overseas, ISEP, CIS Australia, EcoLife, Projects Abroad and Work The World who facilitate various international academic and internship programs each year. Students participating in these programs are eligible to receive a mobility grant. Students are required to submit an online Overseas Short Programs application, with College approval, to La Trobe Abroad before confirming registration or paying fees to the external organisation. Students wishing to apply for an Overseas Short Program outside of La Trobe University’s Exchange Partners and Approved Providers will need to submit a Non-Partner Vetting Checklist in their SOMSAS application and OSP Supporting Documents. The Non-Partner Vetting Checklist can be found in the Forms section of the how to apply webpage and will address aspects of the program including content, accommodation, safety and public liability insurance. If the requirements of the Non-Partner Vetting Checklist are not met, the program may not be approved. Please ensure your screen zoom is adjusted to view all six columns. If not, please use the scroll bar at the bottom of this section's table to view hidden columns. Students approved for an Overseas Short Program with an Exchange Partner will receive a $1000 Mobility Grant. Domestic students participating in an Exchange Partner Short Program are eligible to apply for the limited $1000 Student Mobility Assistance Scholarship (SMAS) [Word 98 KB]. Applications are assessed on a rolling basis and must demonstrate experiencing financial disadvantage. €500 programme fees per week. Accommodation organised by BSB costs €295 in a double room and €515 in a single room per week. Film, TV, Journalism, Creative Arts, Media, Communication, etc. Marketing, Communication, Strategy, Finance, Communication, Entrepreneurship, Innovation, Management, Quantitative methods, Supply Chain Management and Logistics etc. the price includes only tuition fee. Not including airfare, housing, books or personal expenses. (Not including airfare, personal expenses). Not including airfare, personal expenses and others. Please ask for details. MBA students in their second year who are interested in International Business, Finance and Corporate Strategy. Please note: There may be additional study tours running within the School or Department, so please also enquire with your Professors in the event they are aware of other options. Other programs may be available - see CIS Australia's website for a list of courses, deadlines and contact details. Arrivals every Sunday. Closed for the month of September. Projects start weekly. Except from 15/10/19 - 1/01/19, when it is closed due to Monsoon season. Monthly starts available throughout the year. Fixed program dates each year. Year-round. Placements start every 2nd Sunday of each month (approx.). Closed mid-Dec to mid-Jan. Year-round. Placements start on the 1st and 3rd Mondays every month that school is in session. Year-round, when school is in session. Any Sunday arrival. Available January-May and October-December. Monday arrival, Sunday departure. Year-round. Placements start on a Monday. Other programs may be available - see AIMs website. Contact AIM directly for the deadline. Also refer to their website for more information about the program: AIM Website. *Programs to ‘Shanghai International Studies University’ are no longer approved for credit or mobility grants as per advice from the ASSC college. *Inclusions within program costs will vary from program to program. Ensure you check with the individual institutions exactly what is included in the program cost. Students whose degree entails a practicum or clinical placement may be able to do this overseas. 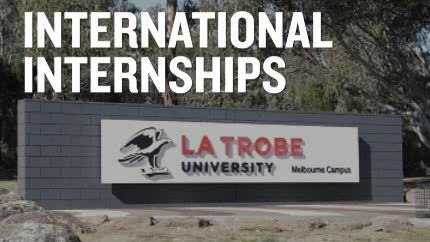 Students can source these placements themselves, through the College or refer to the opportunities available at La Trobe International. Students from the College of Science, Health and Engineering should make contact with the exchange coordinator within the College. All applications must be accompanied by written permission from the student's college including evidence that the placement will contribute towards the student's La Trobe course. Below are some partner universities providing clinical placement opportunities for La Trobe students. Opportunities for students from other courses can be discussed with your course clinical placement officer. Antipodeans Hanoi, Vietnam Allied Health students with a 1st or 2nd year elective available. **Please note, these experiences rarely count as Clinical Placement hours, but are more likely to be counted for meeting particular tasks required of your clinical skills record book. The mobility grant will therefore be the standard Short Program amount, not clinical placement amount and only if you are able to get credit/mandatory component of degree approval. La Trobe students have the opportunity to make a difference and contribute to the global society by participating in a Volunteering Program. As volunteers, students can work towards making a positive contribution towards society, but can also grow as individuals themselves. Volunteering is also a great way of learning more about the functioning and sustainability of a non-profit organisation. Please note, VESA and Reach Out Volunteers are not approved by La Trobe University and will not be considered for credit or mobility grants.